40+ Style » What to buy » The best online stores and brands for plus size women – Do you have a favorite, let me know! 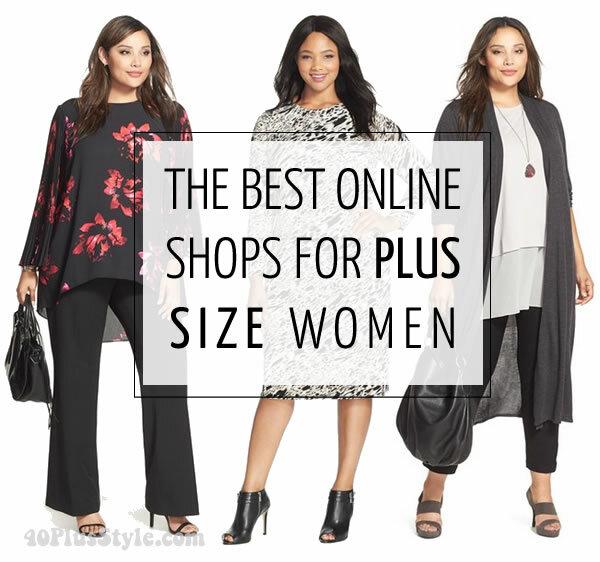 The best online stores and brands for plus size women – Do you have a favorite, let me know! Although a lot has changed since 10 years ago, 40+ plus size women still find it harder to find stores that sell fashionable and chic clothing for them. Most high-end brands still don’t cater to plus size women and neither do many low-end brands. Some brands don’t carry plus size in their stores though but do carry them online. I like to make it easier to find great clothing catered to plus size women by creating this online resource as there are lots of fabulous pieces to shop online now. No more excuses to look great even if you need a plus size! I will kickstart this list with some of the best shops I have found. However, as I’m not a plus size shopper myself I would love to get the input of all my plus size readers. If you have a favorite shop, please let me know in the comments and I will add it to the list. In addition to shops and brands I have also added some of my favorite pieces for fall at the bottom of this article. NYDJ Plus: one of my favorite brands for jeans. They have a great selection of comfortable jeans and pants for plus size women. They also stock blouses and tops. Eileen Fisher plus: another favorite of mine. Known for their superb fabrics and great layering pieces. Adrianna Papell has a great variety of beautiful dresses. 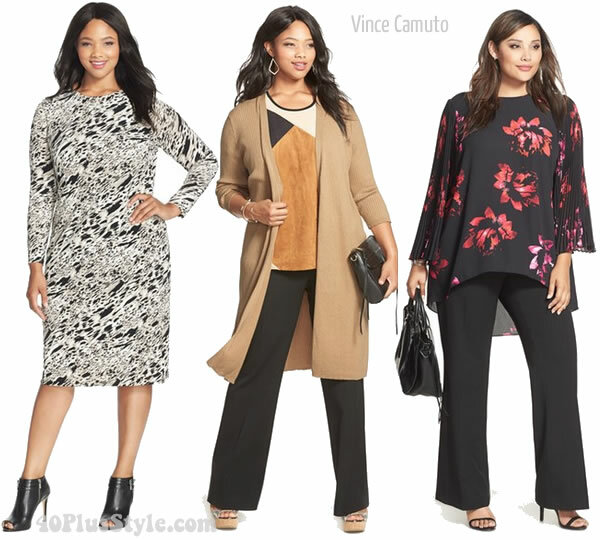 Vince Camuto plus has a great variety of tops, pants and skirts. Michael Kors plus offers affordable options from the famous designer. Lauren Ralph Lauren plus: beautiful sweaters and coats. Tadashi Shoji: one of the best brands for cocktail dresses comes in plus sizes too. Neiman Marcus: large plus-size collection for all occassions. Macy’s: large collection at different price points. JC Penny: very affordable styles. Bloomingdales plus: a good selection of quality brands. Marina Rinaldi: this brand was especially created for plus size women and offers a large selection of clothes. Eloquii: trendy clothing from sizes 14 – 24. Evans: stocks sizes 10-28 and lets you shop by body type. Navabi: a worldwide leading brand for plus sizes with a large selection of plus size fashion. Igigi: specialty store for plus size women with colorful styles. Lane Bryant: A good selection of casual chic clothing. Mel Smith: Good basics and neutrals. Anna Scholz: premium clothing for UK sizes 14-28. The brand recently featured the 40+model Nicola Griffin in their campaign. E-shakti: this brand is famous for its dresses and they offer them in sizes 0-36. Asos plus: lots of affordable and trendy pieces, but pay attention to quality. Covered Perfectly: has a special section for plus size women with tops that are flattering and comfortable. Old Navy: their plus size section is great for jeans and sportswear. Modcloth Plus Size: you need to be selective at this brand but they do have a large selection. I would love to hear from you now! What are your favorite shops for plus sizes? Let me know and I will add them to this list. Wow… how could you leave off classics like Talbots and Lands End? Chicos? J.Jill? Soft Surroundings? Most of your average mall chains have plus-size sections, like Macy’s or JC Penney or Bloomingdales. I wear a 1X and I find that some 18s fit just fine, like the Boden line out of the UK or Peruvian Connection. You can find so much variety and good quality nowadays that my slimmer friends are asking ME where I shop! Thanks Val. Will add these to the list. Great to hear that you have no trouble finding great clothes! These may not all be exclusively plus size, but they have a good selection. All are good quality. I’ve purchased from all. QVC is awesome with name brand designers like Liz Claiborne, Dennis Basso and even Bob Mackie! Thanks for the feedback Kelly. Will add these. I like many of the companies/brands you have listed already. L.L. Bean is great for classics and outerwear and they carry Plus Petite sizes for those of us who are of short stature. In Canada, the Hudson’s Bay Company (thebay.com) carries a good selection of plus sizes in different price ranges (and they have great sales), including lines by Calvin Klein, Jessica Simpson, Jones New York, Chaps, Ralph Lauren, Style & Co, etc. Wonderful article, Sylvia! I’ve been thinking to put the plus size brands that I’m aware of together in a post for a while now, but you have such a great exposure that many women can add to the list that you’ve started, so I’m glad that you’ve done it here. Such stores as Target etc. also have affordable plus size sections, collaborate with famous designers and launch their own plus size lines. As you can see, there is no lack of fashionable, trendy, edgy or classic, conservative clothes in plus size (at least here in the US, and at least on Internet… in stores – the whole different story). What’s hard to find is unique artistic clothing. I will be very thankful if anyone can share information about that (other than boho styles, such as http://www.gudrunsjoden.com, though they are fantastic too, do share!). Thanks everyone for the fabulous website suggestions… for those of us “down under”… now heading into summer… we have great stores here called ts. The staff are fabulous. Changed my life. Thanks Sylvia for highlighting these, and for mentioning summer items for us in recent communications. Love to see what everyone is doing… no matter the season! I agree that TS is a great Australian brand which also has online shopping. The style is quite original with a trend towards the lagenlook cut. It is also available in the uk with stores and online. I do shop at Nordstrom and Neiman Marcus, but when I need a basic legging or a pair of jeans, or a trendy piece that I may not wish to spend top dollar on, I go to Torrid, believe it or not. They have a low price point so you can stock up on basics there. And they sell the only jeans I can wear that don’t make me feel as though I am wearing mom-jeans, and that are comfortable as well. Their premium leggings are super comfortable and come in ankle and full length and are very good fabric. I like to be inspired by their look-books online, which are quite good. Also, I would like to suggest Free People. Many of their clothes will fit those of us who are borderline (12-14-16) between regular and plus sizes (not the jeans, though! ), and they have a beautiful bohemian vibe. Just found your site and enjoyed it. I am looking at best places to shop for plus-sized women. One great site (IMHO) is the new Ulla Popken (ullapopken.com). They have revamped their line and now include their German/European designers line and appear to be phasing out more of the USA clothing line. They have one line in particular, SELECTION, which is of high quality and perfect for 40+ women who are sized 12 and up who work in offices. I absolutely love it. Please check it out. One of my favorite stores…Torrid in the States, trendy styles often a younger modem edge. The clothes are definitely designed with cubes in mind. Also in Canada Penningtons under the same company as Addition Elle. They carry the Jenny McCarthy line and go up to a generous size 6x. I, too, love Old Navy for plus sizes! Also, Avenue is great! I love their dresses and dressier blouses Ann’s tunics. Old Navy clothing seems (to me) to run big, Avenue is pretty on target with sizing.